Long ago, on a wild Scottish coast, a fisherman spent all day at sea, but he caught only a few very small fish. As the sun began to set, the fisherman still had only a meager catch, but when night fell, he rowed to shore and beached his little boat. As he walked toward his little cottage across the pebbly beach, he heard beautiful voices singing a sweet, high, lyrical and lovely tune, a song more beautiful than any he had ever heard. He turned toward the sound and saw what few have ever seen. There, near the water, a dozen Selkie people were laughing and playing and singing. The fisherman could not believe his eyes. Few ever saw the seal folk who now and then cast aside their skins, and took on human forms to play onshore. The fisherman stood and stared but when the Selkie people noticed him, they quickly dived into the sea, and slipping beneath the rolling waves, they disappeared. "I must a been dreamin'," said the fisherman aloud, and again he turned toward his cottage. But something nagged at him, so he turned again, and this time he noticed something sleek and shiny lying on a rock. He walked closer, and now he saw: It was a seal skin. "No one will ever believe I've seen the Selkies unless I show them this," he said, and so he leaned over and picked up the skin and slung it over his shoulder. And as he walked, he whistled, and then he suddenly stopped. "My, what a fine penny I'll earn by selling this." And just as he said this, he heard footsteps close behind him, and fearing a thief, he quickly turned to look. Now there was no thief behind him. No indeed. It was an exquisitely beautiful young woman standing there, but she was weeping so hard, it nearly caused the fisherman's heart to break. "Beautiful lady," he said, "why do you weep?" She sniffed and looked into his eyes. "Kind sir," she said, choking back tears, "you have my sealskin. Kindly give it back, for I belong to the Selkies, and I cannot live under the sea without my skin." The fisherman could not stop staring. You see, he had fallen in love at first sight, and because he was a young man, and terribly headstrong, he thought he must keep her with him. He clutched the sealskin to his chest, pressing it to his pounding heart. "Dear lady," he said gently, "be my wife, for I have fallen madly in love with you, and without your sealskin, you'll have to live on land. I'll make you happy, that I promise." "Please sir," she cried, "my folk will be so worried. I must go home. Never could I be happy on land." But the young man was stubborn. He was that way. So he smiled as sweetly as he could, bowed his head and bent down on one knee. "Dear woman, my cottage is a cozy place. I'll keep you warm by the fire, I'll feed you plentifully all the fresh fish you could ever wish to eat. I promise you will live a happy life on land as my bride." The young woman felt helpless without her skin. "I fear I must go home with you until you will return my skin," said she, and saying this, he took her hand and led her to his home. For many weeks the fisherman kept the sealskin with him for he feared his bride-to-be would steal it and slip away. But after a while, the sweet lady began to settle in to this life on land, and when the fisherman saw she felt happy, he stuffed the skin inside a crevice in the chimney. "There my girl will never find it," he said to himself. Another month went by, and they married, and time passed very nicely indeed. They led a happy life, for though the fisherman was stubborn, he was also kind and generous. He truly loved his wife, and he always worked hard to make her happy. After a while the Selkie woman grew to love her stubborn husband, and sometimes she would sing to him. Those nights he was the happiest man in the world. And as the years passed, the couple had seven children, and the Selkie woman loved these lads and lassies with all her heart. Most of the time the family was very happy, though every once in a while the children would find their mother on the beach, gazing wistfully out to sea. They would circle her and ask, "Mother, why do you look so sad?" And she would shake her head and kiss their foreheads. "Never you mind," she told her children, "I've only been dreaming too long." One day the fisherman and the three eldest children went out in their boat to catch fish. The next three walked to the village to buy some bread and milk and the mother and her youngest son stayed home alone. Now the mother looked out the window and watched the waves crashing onshore. Far in the distance she noticed, on the slick, black rocks, a band of seals playing and barking. She sighed deeply, and her eyes filled with tears. Her youngest son ran to her side. "Mother, what's wrong?" he asked. "Whenever you look out to sea, you grow so sad." Without thinking she turned and said, "I'm sad because I was born in the sea. It's the home to which I never can return because your father hid my sealskin." 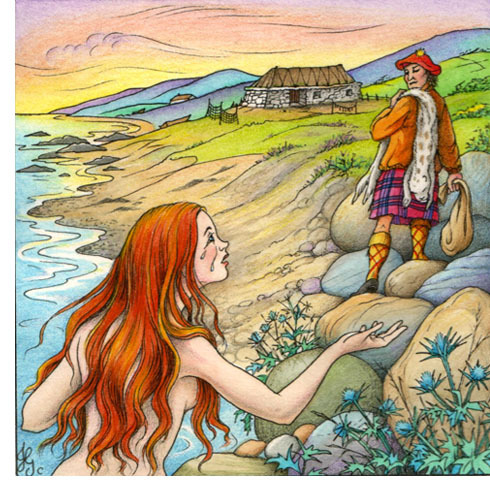 Now the boy, like all children in Scotland, had heard tales of the Selkie folk, so right away he knew what his mother must be, and he ran to the fireplace, reached up and pulled the sealskin from its hiding place. He held it out to his mother. "How did you find it?" she asked, astonished at the sight of her skin. "One day I was here alone with father," said the boy, "and he took this from its hiding place and stared at it. I knew it was special, and now I understand what it is." The woman embraced the sealskin, and then she reached for her child and embraced him. "My darling," she whispered, "I will always love you," and then, clasping sealskin to her heart, she ran outside and down to the sea. She slipped into her skin and dived into the bracing water. Soon after that moment, as they were heading home the fisherman and his children rowed past a group of seals. As they passed, the fisherman noticed a sleek young seal gazing at the boat, a strange expression on her face. And just as they were motoring out of sight, he heard that seal cry, a plaintive sound, and then she disappeared underwater. When the fisherman arrived home, he learned what had happened, and he felt his heart breaking in two. But he understood his son was a loving boy. He was braver and more generous than the fisherman had ever been. Forever afterwards the fisherman and the children missed the Selkie Woman, but knowing she was happy in the world where she belonged gave them a measure of joy.